The old adage is true: When it rains, it pours. Not only is there a very good chance that we’ll see a Apple 4K TV at tomorrow’s iPhone 8 keynote but, to add icing to the cake, Amazon’s next two Fire TV devices were leaked earlier today by AFTVNews. The information in the report specifies two new models: a Chromecast-esque streaming dongle that will hang off the back of the TV, and a square version of the Amazon Fire TV that will come with a powerful microphone built right into it. Both devices will support 4K HDR at 60 frames per second. The streaming dongle iteration of the Amazon Fire TV will sit in between the Amazon Fire TV Stick and standard Amazon Fire TV, and likely hover around the $60-80 (£40-70) price point. The larger, cube-shaped Amazon Fire TV is likely to be the new flagship model, and will heavily rely on Alexa, Amazon’s smart assistant. According to documents obtained by AFTVNews, the cube will come with a built-in microphone and glowing LED, similar to the ones found in the Amazon Echo and Amazon Echo Dot, that will allow you to speak directly to Alexa without holding a remote. Beyond the far-field microphone and LED bar, the larger Amazon Fire TV device will also have an IR emitter that will allow it to work with older TVs that don’t support the HDMI-CEC standard. Neither device has been officially confirmed by Amazon at this point but, given the substantial proof AFTVNews has in hand, it seems inevitable at this point that Amazon will do so soon. 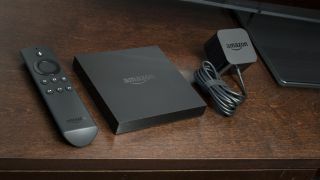 Any other day, and the two new Amazon Fire TV devices would consume the entire industry’s attention – any other day except the day before a big Apple event, that is. Apple’s event on September 12 is reportedly the place we’ll see the 4K Apple TV for the first time. It’s something Apple spent some time gearing up for, and tomorrow we might finally see the fruits of that labor. With two new Amazon devices and a new Apple TV en route, it’s only a matter of time before we have another all-out streaming box battle.